The leafy Hickory tree is a species found abundantly around the world. It is a hardwood and is fantastic for long smoking meats, especially pork and bacon. The bold flavor produced by smoke from Hickory Wood Chips is bold and often associated with southern barbecue. Soak the Hickory Wood Chips in water for at least 30 minutes before you are ready to smoke. You don’t have to use just water. Other liquid pairings go well with Hickory like beer, bourbon, ginger ale, Coke, apple juice, pineapple juice and even a cabernet sauvignon. Remove the wood chips from the liquid and place them in the Napoleon Smoker Tube, then directly onto the sear plates of your gas grill, or into the integrated Smoker Tray in the Napoleon Prestige PRO Series PRO665 Gas Grill. Once the Hickory Wood Chips begin to smoke, put the food you’re adding flavor to on the grill. 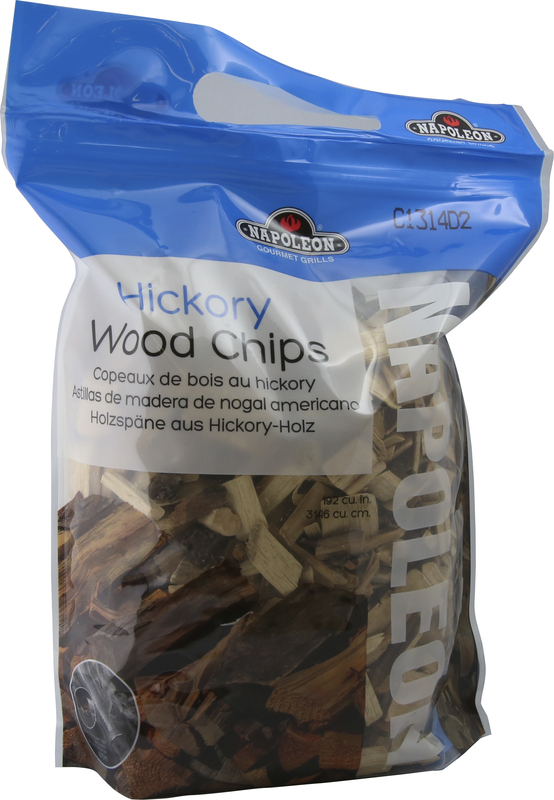 Keep the lid closed while smoking to get the most out of your Hickory Wood Chips.